Bruce Gilkison, a descendant of James Hogg, follows in the footsteps of his ancestor in the Scottish Highlands while retracing the remarkable rediscovery of Hogg’s works a century after his death. In this introductory extract Gilkison explains why walking the same paths as Hogg led to much more than just a journey into the past. 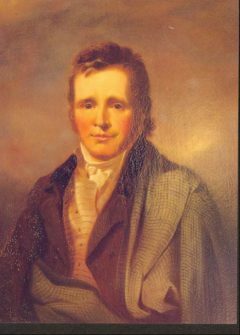 When Hogg began his Highland journeys in 1802, it was a pivotal time in his life. He was thirty-two and unmarried. He had been working on the land since he was seven. He had taught himself to read and write. He had written some poetry, and even had some published, but nothing that would have been remembered if he had stopped right then. His father and brothers and grandparents were farmers or shepherds. He assumed his future was in farming, and he was setting out to find a farm to lease. He wanted to be a great writer too, but had no idea how to do that. He wouldn’t have known it then, but he was exactly half the age he would ever reach. The journeys would change the next half of his life. Had their outcome been different, it’s unlikely we’d know him now. After his 1802 trip there were two more journeys in the next two years. All of them were aimed at securing a farm. But because he was keen to learn and to write about Scotland, they would take on a greater significance. When I set out, I was double his age. I would follow his journeys, but not every step. The land has changed: large areas are built up, and in others the traffic is too heavy or noisy. But I would go to some places he missed, and I’d cycle in some parts, and hitch or take ferries or other public transport where nothing else worked. 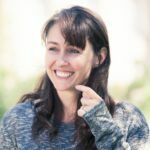 I would camp where possible – it’s what I could afford, and luckily what I love. I’d get blisters and bruises and sometimes get into tricky situations. More importantly, I’d meet people. Writers and artists and Hogg experts, some Descendants of people he’d met. I’d climb hills he’d climbed or admired, I’d eat and drink and sleep in some of the same places, and compete in a sports event he started almost 200 years ago. I’d travel to Canada, too, for the ‘James Hogg and His World’ conference. For various reasons, I couldn’t always do his walks in the sequence that he did. In 2014, I travelled in the Borders, out west to Harris and Skye, then through the Central Highlands and the Cairngorms. In 2015, I started and finished in the Borders, went up through the Central and Western Highlands, out to Lewis then back through the Hebrides and Loch Lomond and The Trossachs. This is a story of my ancestor’s journeys, through the Highlands and Islands, and through life and literature and other strange places. It’s about a journey that continued after he died, and hasn’t finished yet. It’s a story about my own journeys too. And I had no idea where any of these might lead. 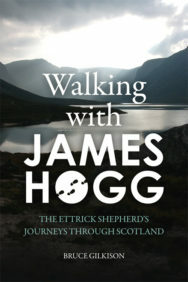 Walking With James Hogg by Bruce Gilkison is out now published by Edinburgh University Press priced £14.99. If you enjoyed this article you might also enjoy this article on Books from Scotland by Bruce Gilkison published earlier in 2016.